Copyright © 2018® - Brid.tv are registered trademarks. Use this implementation if you want to do minimal coding and let the player handle all your bidding functionality. 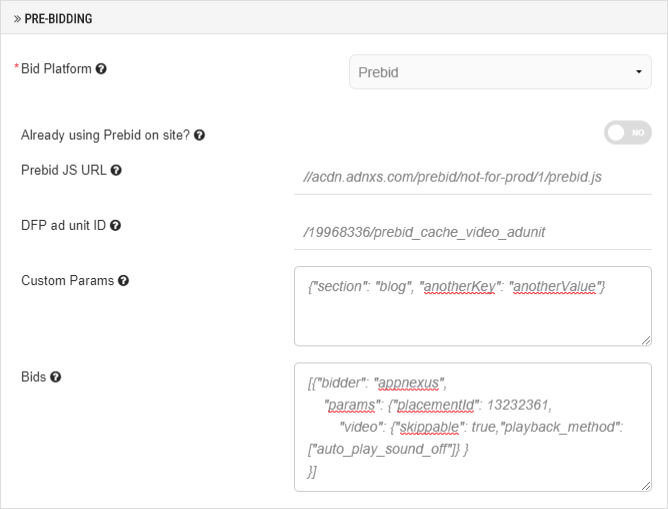 All that needs to be done is to set up your prebid params inside the player settings area and let the player do the rest. Once this is set up, all you need to do is grab an embed code for a video or playlist using this player and paste it to your site. The player will automatically read these configuration parameters from your page and use them when it starts the bidding process. If you have any prebid extension installed inside your browser, this implementation may not work due to potential conflicts so please have this in mind.